The second half of zombie appreciation night at the Toronto After Dark Film Festival featured a film that some people have been waiting a long time to see. Christian Burgess, a new addition to the programming staff at TAD, had been following this one for years, as news of the film would sometimes appear online, but would be followed by prolonged periods of silence. Director Marko Mäkilaakso spent five years finishing War of the Dead. Unforunately, the finished product left me a little bewildered, as there are plenty of positive things to say about War of the Dead, but the film never felt as entertaining as it should have. The feature was preceded by a short film called You Are So Undead by director Alex Epstein. The short takes place in the ladies washroom of nightclub and follows a group of girls, some of which no longer cast reflections in the washroom mirrors because they have lost their virginity. This is a cute short that puts a spin on the over-tapped vampire genre. Back to War of the Dead. The story takes place during WWII. A group of American soldiers find themselves severely outnumbered in a firefight and fall back to save the lives of the few remaining men. They wait, nervously holding their breath, for an enemy counterattack that could potentially wipe them out, but the enemy soldiers never come. Instead, out of the shadows and trees comes a terrifying troop of the undead, hellbent on ending the lives of the soldiers. As I have said, War of the Dead does a lot of things right. I was not familiar with the work of Marko Mäkilaakso, but it appears that he had previously made a career as a director of music videos, commercials and TV shows. His experience and technical skill are certainly on display in War of the Dead. The cinematography is effective, the lighting is appropriately dark and gloomy, and the action is fast-paced. However, much like I found in Alexandre Courtès’ (another music video turned feature film director) The Incident, the non-technical aspects of the film came up short. Initially the soldiers are placed in a hopeless position (important for any zombie movie), but I never found myself getting attached to any of the characters and truly caring about their fate (crucial for zombie movies). Also, the film tantalizes the audience with an interesting occult angle, in the form of a small archaic device. However, the writers do not pursue this angle strongly enough, something I would have loved to see and could have made the movie more interesting. Finally, the combination of the mediocre acting and the lack luster script creates some rather bland dialogue that really could have used some of the clever banter and wit found in DeadHeads, although admittedly in smaller doses due to the different atmosphere of the film. As for the zombies themselves I think that Marko Mäkilaakso and company made the right call. The undead are of the 28 Days Later variety, the type of zombies that can run at breakneck speed. I really think that slow zombies should be reserved for horror\comedies at this point like Shaun of the Dead. It has become quite difficult to scare an audience with a lethargic, arthritic, stumbling cadaver. In the end, I think that Marko Mäkilaakso should be proud of his feature debut. Technically, the film is a fine one, and really feels like a big budget affair. 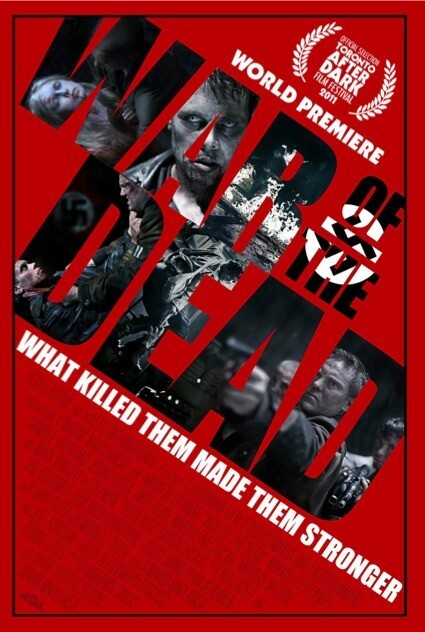 The non-technical shortcomings of War of the Dead are a perfect example of what a difficult collaborative process making a feature film can be. Incredibly talented individuals are needed across the board to make a great movie. I am eager to see Marko Mäkilaakso paired with a polished script to really see what he is capable of.